In a medium bowl combine all ingredients and stir to combine. Set aside. To butterfly prawns hook prawn on middle finger of your left hand- tail down. With the back end of paring knife slit the outside vein almost but not quite completely thorough. Place butterflied prawns split side down on a baking sheet. Place a small spoonful of crab filling on each prawn. Tail will rest on crab filling. Drizzle with olive oil and sprinkle with Parmesan breadcrumbs. Bake in 350 degree oven for 10 minutes. Remove from oven. To serve place a large scoop of wild rice pilaf on center of plate. 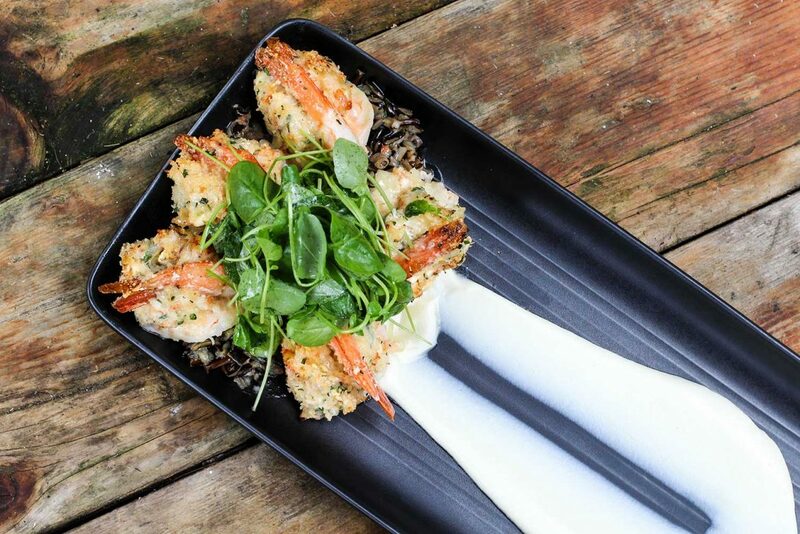 Place baked prawns on top of pilaf and garnish with watercress. Serve cauliflower puree alongside. Prepare wild rice. Set aside. In a large saute pan over medium high heat add olive oil, carrot, onion, celery, fennel and garlic. Saute until onion is translucent. Add parsley and chives and stir to combine. Add cooked wild rice and butter. Stir to combine. Add salt and pepper to taste. Keep warm. In a large soup pot bring 6 cups water to rolling boil. Add remaining ingredients and boil until cauliflower is tender - about 8-10 minutes. Reserve 1 cup liquid. Drain remaining liquid. Place cauliflower in a blender and slowly drizzle in as much reserved liquid as you need so that cauliflower is a smooth, creamy consistency.